John Saunders reports: As they probably don’t say in Russian, “as one Vlad closes, another Vlad opens”. The old Vlad (Kramnik) won everything worth winning in chess, except the Gibraltar Masters, before bringing down the curtain on his chess career the other day. 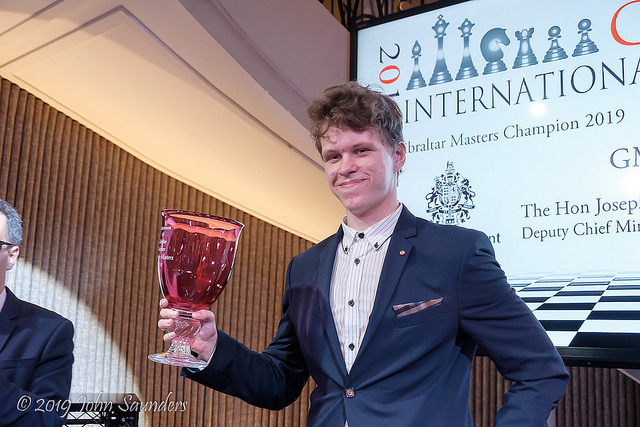 By contrast, the new Vlad (Artemiev) hasn’t won anything of note... until today, that is, when he won the Gibraltar Masters, and in the most accomplished style in a last round that featured wins for the lower-rated player on all three of the top boards. I should get the day’s headlines out of the way before trying to assess the magnitude of today’s results. 20-year-old Russian grandmaster Vladislav Artemiev, overnight leader, completed a brilliant victory in the final round of the Gibraltar Masters, played at the Caleta Hotel, after defeating the fourth seed Yu Yangyi (China) in his last game to reach an unassailable score of 8½ points out of 10 and obviate the usual need for a tie-break. The young Russian, who was making his debut on the Rock and only three-months married, takes home the winner’s cheque for £25,000. Artemiev’s score of 8½ has only been bettered once in the history of this tournament by Vassily Ivanchuk when he scored an amazing 9/10 in 2011, and it has been equalled only a couple of times. 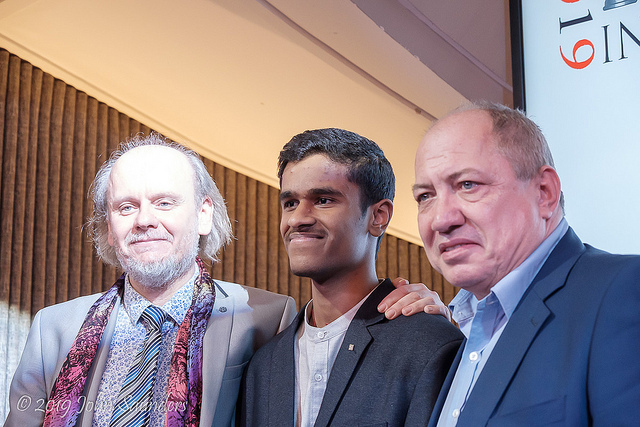 The destination of the £20,000 second prize was an even bigger shock, going to the 19-year-old Indian grandmaster Karthikeyan Murali, rated 2570 and seeded only 49th in the tournament pecking order, who finished with a sensational win against the tournament number one seed, Maxime Vachier-Lagrave, to finish on 8 points. The top women’s prize of £15,000 went to former women’s world champion 27-year-old Tan Zhongyi of China who won her final round game to finish on 7 points. Artemiev’s success was absolutely deserved, by any yardstick you choose to apply. He played five of the top-rated six players in the tournament and achieved a jaw-dropping TPR of 2941. Those of us old enough to remember will find ourselves thinking back to 17-year-old Alexander Morozevich’s performance at the London Lloyds Bank tournament of 1994 when the Russian player scored 9½/10 for a TPR of 2970. Artemiev’s score and TPR may fall slightly short of Morozevich’s but the opposition in Gibraltar was significantly higher rated than in London in 1994. Artemiev’s last-round win with Black against a seasoned tournament competitor as tough as Yu Yangyi had more than a touch of Carlsen about it, and I mean the Carlsen of a few years ago when he regularly ground super-GMs into dust from seemingly innocuous positions. The opening was an advanced (3.e5) Caro-Kann but soon departed from known lines. Engines preferred White for a while, perhaps based on the awkward gash in Black’s kingside. 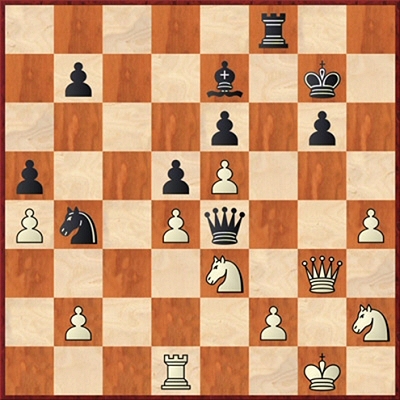 Artemiev’s queenside knight went on a curious tour, returning to its original square before penetrating as far as a2 before settling on b4 where it started to exert an influence on the game. Artemiev then sacrificed a pawn for more queenside pressure, whilst also setting up alternative ideas of attacking on the kingside. Eventually he latched onto a position slip by Yu Yangyi and caught his opponents’ two knights flat-footed and getting in each other’s way. Yu Yangyi jettisoned his extra pawn to try to get back on level terms but Artemiev was relentless, won a pawn and outmanoeuvred his opponent to secure victory. It was a real tour de force, or maybe that should be tour de horse. After the shadow boxing of the last few moves, White miscalculates. Instead 33.Ng2 is fine. Perhaps White thought his extra pawn was worth trying to exploit. 33...Nc6! Black switches focus onto the d4–pawn. 34.Qe3 Rf4! 35.Nf6 35.Qxe4 Rxe4 is even worse with the d4–pawn lost and the h4–pawn also in danger. White is obliged to cash in his extra pawn to try and right his ship. 35...Bxf6 36.exf6+ Kxf6 37.Qxe4 Rxe4 38.Nf3 Ne7! This wonderful knight is on the move again, this time to menace the d4 and h4 pawns simultaneously from f5. 39.Kg2 Nf5 40.Rd3 Nxh4+ Its job well done, the knight leaves the board with its master very close to being £25,000 richer. 41.Nxh4 Rxh4 42.Kg3 g5 43.Kg2 After 43.Rf3+ Kg6 44.Re3 Kf5 White is no better off. 43...Re4 44.Kg3 Kf5 45.Kg2 g4 46.Kf1 b6 47.Kg2 Re1 48.b3 Ke4 49.Rd2 Rb1 50.Kg3 White can chase the king back with 50.Re2+ Kf5 51.Re5+ Kf6 but it makes no difference as his pawns drop like ripe apples. 50...Kf5 51.Rd3 Rh1 52.Kg2 Rh3 0‑1 53.Rxh3 gxh3+ 54.Kxh3 Ke4 is an easily won king and pawn endgame. Much the same comments apply to second-placed Karthikeyan Murali who was an unknown in chess circles outside India before playing in Gibraltar. Karthi (as he’s known to his friends and, soon, the chess world) started slowly with two draws and lost a game to four-times winner in round five, but finished with an astonishing burst of five wins from his final five games, all against seasoned grandmaster opposition. Many strong players from India have taken part in the Gibraltar tournament, including the legendary world champion Viswanathan Anand, but none of them have matched Murali’s fine score of 8 points. Before the game I don’t think many people gave Karthi much chance of surviving a close encounter with MVL. But that put psychological pressure on the Frenchman to try and win with Black. Naturally he turned to his beloved Najdorf Sicilian to do the job for him but Karthi was ready with a small improvement to MVL’s previous game with Motylev. Probably in a bid to win at all costs MVL chose a plan with Bh6 and f6 rather than exchange off his light-squared bishop for White’s d5-knight. But it all went horribly wrong for him and he was left with a light-square weakness which couldn’t be remedied. He tried a piece for two pawns sacrifice but Karthi’s response was immaculate and the point duly annexed. There was another significant last-round surprise as last year’s winner Levon Aronian (Armenia) crashed to defeat against David Howell, propelling the English grandmaster to a share of the third prize with former Gibraltar winner Nikita Vitiugov (Russia) and David Anton Guijarro (Spain) on 7½ points, each of whom took home a cheque for £11,000. Aronian seemed to be afflicted with that strange caïssic disease known at all levels of the game as last-round madness. The first symptom was a shaky-looking 7.Qc2 move allowing his opponent to take the initiative in the centre, but the worst manifestation was his attempted remedy 11.c4, giving up a piece for a pawn and, as it turned out, no compensation whatsoever. It happened that Aronian was sitting next to Nakamura during this game, and the American’s facial expressions of puzzlement, surprise, and downright disgust at his neighbour’s play were picked up by the webcam, bringing great hilarity to the web audience during the last round. There is a clip on YouTube if you want to see for yourself. 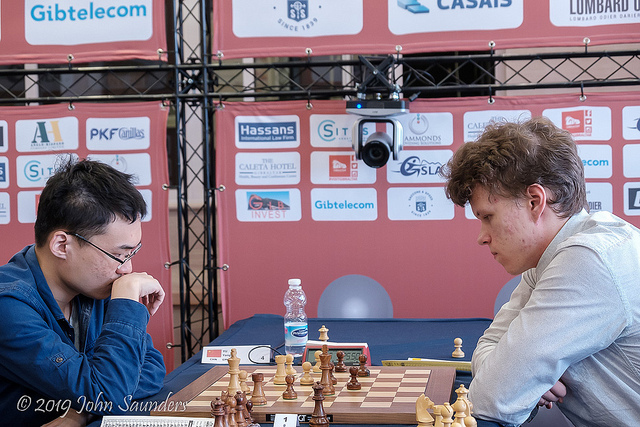 Nakamura himself played out a draw with Nils Grandelius, so the two of them finished in a large tie for sixth place. 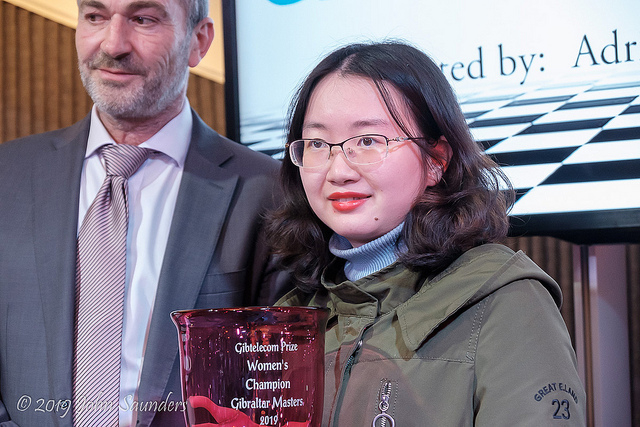 Former women’s world champion Tan Zhongyi started relatively slowly but she had a run of three wins at the end of the tournament to overtake Anna and Mariya Muzychuk from Ukraine. Mariya Muzychuk seemed certain to lose her final game but she salvaged a draw to secure the second women’s prize of £10,000. Tan Zhongyi did well to defeat Aleksandar Indijc of Serbia rated around 130 points ahead of her. That’s about it for another year. I hope readers have enjoyed the tournament as much as I have. It’s been a tremendous showcase for the spectator appeal of open tournament chess, with more memorable and decisive games than you’d get in decades of closed elite tournaments. And, as tournament founder Brian Callaghan pointed out in his closing address, a showcase for brilliant young talents – what he referred to as their ‘Hollywood moment’. Long live the Gibraltar International Chess Festival!